Ankara – Syrian refugees in Turkey are leading the way pioneering web-based services that provide access to information their community needs to help them set up a new life. They have quickly won support from international companies and organizations, and now their apps and online platforms provide displaced communities with housing and job listings, translations of Turkish laws, advice on getting residence permits, opening a bank account, and more. Roughly 220,000 of the 3,300,000 Syrians in Turkey live in refugee camps and receive housing and basic needs assistance. The rest live in big cities where it can be difficult to find legal employment to build sustainable livelihoods for them and their families. As a result, many turn to the use of technology especially social media and apps that help them navigate the local context. The convenience and accessibility of online work is also a factor attracting Syrians to the tech sector. Recognizing the growing trend of displaced persons seeking solutions and employment in the tech industry, IOM, the UN Migration Agency, provides Information Technology and Communication (ITC) skills development through its emergency response programme in provinces on the Syrian border including Gaziantep, Sanliurfa, Hatay, and Izmir. To date, IOM’s Entrepreneurship Training and Grants Project has reached 555 displaced persons, enrolling 87 of them in an intensive 90-hour training course and providing select teams with seed funding to create their own startups. One of these beneficiaries is a young man named Khaled Fattal, a 28-year-old Syrian IT engineer and project coordinator for an organization called Kodra that trains Syrians on how to start their own companies. Khaled participated in an IOM-hosted workshop in Gaziantep on 5-6 December that brought together a diverse group of UN agencies, international organizations, Turkish and Syrian tech companies all working to better integrate displaced persons in the tech sector and create win-win solutions for ITC companies and Syrians looking for jobs. “Taking part in this workshop made me familiar with companies I did not know about before that provide IT training to Syrian refugees. 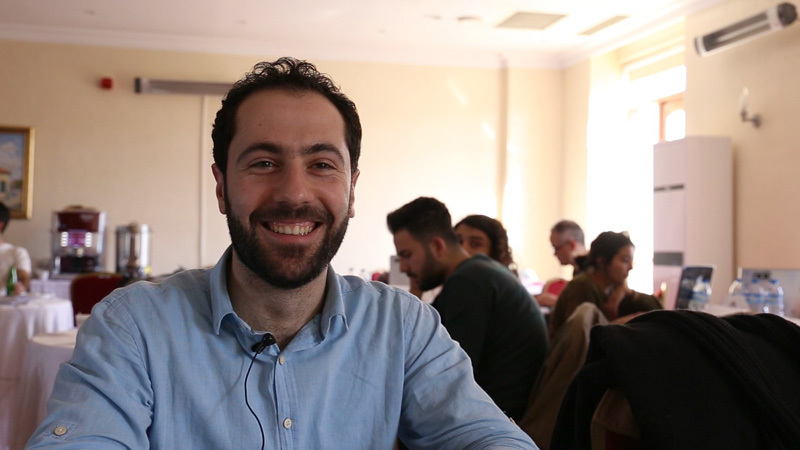 It’s also provided me with more connections that will help the Syrians Kodra works with to reach more clients,” said Khaled. Representatives from companies such as Turkcell, Cisco, and NGOs such as Re:Coded and Natakallam, participated in the workshop to discuss how to build stronger working partnerships. Some of discussion focused on how to tackle challenges Syrians face in terms of finding longer-term freelance work, securing jobs in the formal sector, and overcoming barriers such as restrictions on international bank transactions, etc. Furkan Ozdil, a representative from Turkcell’s Corporate Social Responsibility department, shared another important barrier they are addressing. “Turkcell’s Hello Hope mobile app is helping integrate displaced Syrians through providing Turkish language education, with the aim to help them overcome language barriers and improve their employment prospects,” he said. The app also provides easy access to Turkcell’s Arabic Call Center and provides information on general services available to them. IOM Turkey plans to expand the programme to additional provinces in 2018 and increase the number of entrepreneurship grants for innovative projects.